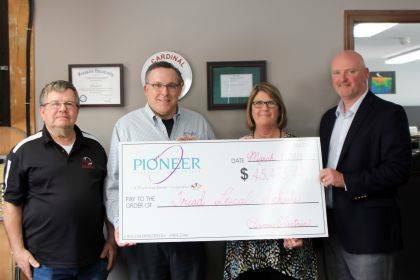 Triad Local Schools received a $45,475.44 rebate check from Pioneer Electric Cooperative for an energy savings project recently completed. Energy Optimizers worked with the district to retrofit all interior and exterior lighting with LED bulbs. The district already sees the benefits of using less electricity. Some inside lights are controlled by movement sensors, and some outside lights are controlled by timers. From left are Rick Wilkins, Triad maintenance supervisor, Ted Reithman, Pioneer Electric Cooperative, Connie Cohn, Triad treasurer, and Chris Piper, Triad superintendent.